[SEPT. 17, 2001] The 31st annual Abraham Lincoln National Railsplitting Contest and Crafts Festival included the Hoppin Watermelon Contest. Winners were named in several categories. Marty Oltmanns — 19 lbs. [SEPT. 17, 2001] Three Missouri railsplitters and one from Illinois walked away from the Logan County Fairgrounds with the honors and the prize money Sunday at the 31st annual Abraham Lincoln National Railsplitting Contest. Marty Yount of Hiram, Mo., who has taken first place in previous years, is once again the national railsplitting champion, taking home a cash prize of $1,000. 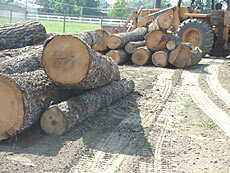 Yount was the first to finish splitting his 10-foot red-oak log into eight even rails. Judging was based on time and also on the quality of the finished rails. Taking home second place and $500 was another Missouri contestant, Ryan Evans of Silva. Ryan, who won fourth last year, is only 21 years old and promises to be back in the years ahead. At the other end of the age spectrum, Oliver Friedlein, 63, of Hull, who came in second last year and has taken first in previous years, took home the third prize of $250. Roy Usery of Des Arc, Mo., placed fourth and took home $100. Roy has been entering the competition here since 1987 and has placed several times. Even if Oliver Friedlein decides to retire (which hasn’t happened yet), Friedleins will still be splitting rails in future Lincoln contests. This year Oliver’s son, Chris Friedlein of Leroy, and his grandson, Cory, also of Leroy, were among the contestants. As usual, Missouri was well represented in this year’s contest. Also entering were Brad Jones, Tony Meloy and Jason Hill, both of Greenville, and Dwayne Yount of Hiram. 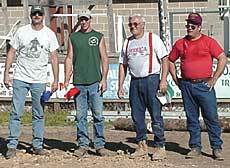 Kentucky sent three contestants from Hodgenville this year: Terry Obersen and brothers Daniel and Matt Trumbo. From Illinois, along with the Friedleins, were four more contestants: Glenn Bryson of Lake Fork, Bud Johnson of Danvers, Jonathan Norwin of Leroy and Casey Jones of Lincoln. All contestants brought their own tools: wedges, mauls, sledges, and double-bitted axes. Winners in Saturday’s two-man team split contest were Marty Young and Larry Hill of Greenville, Mo. Jason Crider of Arrowsmith won the men’s amateur contest and, like all amateur winners, must now compete in the professional class. Winner of the junior division railsplitting contest (up to age 13) was Tim Hill of Greenville, Mo. Another honor, a plaque, was presented to Ted Young of Peoria, who for many years has brought to the festival the miniature steam train he built himself and has given free rides to children. 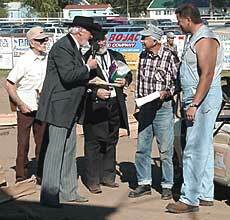 Before the contest, the historic christening of Lincoln by Abe himself was re-enacted in front of the grandstand. Lincoln’s own Charles Ott played the part of Abe, cutting a watermelon with his pocket knife and distributing pieces to those dignitaries who attended the christening. Those dignitaries, wearing appropriate costumes, were Robert Latham of Lincoln (played by Daris Knauer), Virgil Hickok of the Springfield and Lincoln area (Dean Tibbs), John D. Gillette of Elkhart (Robert Presswood), and "the little Stevenson boy" who wrote about the event later (Todd Schumacher). A highlight of Sunday’s activities was a concert by the 33rd Illinois Volunteer Regiment Band, playing music of the Civil War era — quicksteps, marches, ballads and polkas — on authentic period instruments. Band members also wore uniforms patterned from actual uniforms worn by Union soldiers. 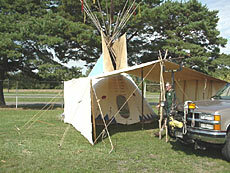 Historic displays, including quilts and other handicrafts; demonstrations of old-time crafts; a talking buffalo; Indian tents and lodges; antique machines and farm implements, some powered by steam; historic displays from Lincoln and other area communities; contemporary craft items for sale; a flea market; Boy and Girl Scout encampments; and plenty of food concessions were available for the more than 4,000 people who attended the two-day event. 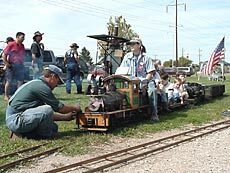 [SEPT. 13, 2001] The 31st annual Abraham Lincoln National Railsplitting Contest and Crafts Festival will bring a full schedule of events for the entire family to the Logan County Fairgrounds this weekend, Saturday, Sept. 15, and Sunday, Sept. 16. The highlight of the weekend, the championship railsplitting contest, is set for 3:15 p.m. Sunday, when contestants will compete for cash prizes of $1,000, $500, $250 and $100. Working against the clock and seeking perfection in the outcome, railsplitters will work with solid red-oak logs which must be split into eight uniform rails. Splitters will bring their own tools. Anywhere from 15 to 20 splitters, from the Midwest states of Kentucky, Missouri, Illinois and Indiana, are expected to compete for the championship, according to Nancy Kleinman, Logan Railsplitting Association president. The contest will take place in front of the grandstand at the fairgrounds. The festival is based around the era in which Abe Lincoln lived, and its aim is to help promote tourism in Logan County, Kleinman said. Festivities begin at 9 a.m. Saturday with an opening ceremony. The exhibits at the fairgrounds will carry out the theme of the Lincoln era, and many of them are geared to be educational for children. A talking buffalo will tell visitors how the buffalo was important to Native Americans. 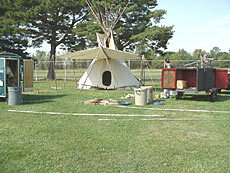 Eight Indian lodges will be set up to show how native people lived and worked. About 40 people will be demonstrating a variety of early American crafts, including skills like chair caning, woodworking, making apple butter and lard, making brooms, tatting and bobbin lace. A frontier farm will include a henhouse with nests, a wash house, ducks and sheep, and a smokehouse for preserving meat for winter use. A horse and buggy will be on hand both days to give carriage rides to the public for $1. Historic displays from all over Logan County, including displays of Indian arrowheads, will be set up in one of the buildings on the fairgrounds. 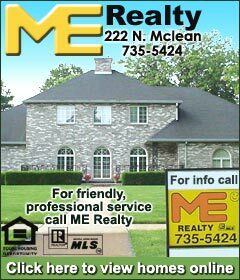 Other buildings will hold crafters from all over Illinois who have items for sale. A flea market will be on the north end of the fairgrounds. A quilt show will demonstrate quilting techniques and display a variety of quilts. Bed-turning stories, on both Saturday and Sunday, will feature four women who take turns telling stories about the history of the quilts that are placed across an old-fashioned bed. Bed-turning stories on Saturday will be told at 10 a.m., noon, 2 p.m. and 4 p.m. On Sunday they will be at 12:30 and 2:30 p.m.
Steam-powered machines, such as corn shellers, and antique tractors will also be demonstrated on the fairgrounds. 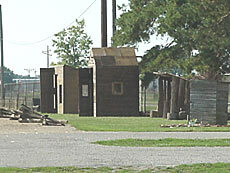 Logan County Boy and Girl Scouts will set up encampments. Girl Scouts will demonstrate cooking skills and sell corn on the cob to fair visitors. More than 50 food items will be on sale, including rib-eye sandwiches, grilled chicken, corn on the cob, corn dogs, walleye sandwiches, onion blossoms, elephant ears, funnel cakes and lemonade shake-ups. There will be contests of various kinds, most in front of the grandstand, on both Saturday and Sunday. Most contests will award cash prizes. Saturday events begin at 10 a.m. with the women’s firewood split contest. Contestants must split four pieces of firewood from an 18-inch log. Also at 10 a.m. is the Fred Hoppin Memorial Watermelon Contest. Prizes will be given for the best carved and decorated watermelons. At 10:30 a.m. there will be a log rolling contest in a 5-foot water pit, with teams of four men and one woman. A crosscut saw contest for women and professional classes will be at 11 a.m.
A tree fall contest, where contestants chop down logs "planted" in the ground to stand erect like trees, will be at 1:30 p.m. A team railsplitting contest will be at 2 p.m. and a junior railsplitting contest at 2:45. An amateur railsplitting contest, in which contestants split six rails from oak logs, will be at 3:30 p.m. Saturday. On Sunday a nondenominational worship service will be at 10 a.m. in a tent on the grounds. A tomahawk throwing contest will be at 11 a.m., with both men and women trying to cut a playing card in two with a tomahawk. A rail toss contest is set for 11:15 a.m. and a cow chip throw at 11:30. A corn shelling contest for children, men and women will be at 11:30, with each contestant trying to be the first to fill up a can with shelled corn. At noon three-man teams will make campfires and see who can boil water first. At 3 p.m., just before the championship railsplitting contest, Lincoln impersonator Charles Ott will re-enact the Aug. 17, 1853 christening of the city of Lincoln with the juice of a watermelon. On both days, a parade of antique cars and tractors will end the festivities in front of the grandstand. On Saturday, entertainment will be provided by the Logan County Starlites at 10:30 a.m., Andy Wiesenhofer with western music and cowboy poetry at noon, the Flying Feet Cloggers at 1 p.m., and the Prairie Aires at 3 p.m.
On Sunday, country music will be provided at 11:30 a.m., and Andy Wiesenhofer will appear again at 12:30. 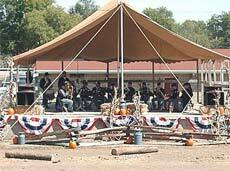 At 1:30 p.m. the Civil War Band from Bloomington will present a program, playing Civil War-era instruments and talking to the public about the times and the music of the era. On both days, there will be drawings for cash prizes. Admission to the fairgrounds is $2 per person, with children under 12 free. Parking is free, and handicapped parking is available. "The railsplitting contest is a tradition here in Logan County," Kleinman said. "We have been doing it for 31 years and never missed a year. Our motto is, ‘Visit the past, enjoy the present.’"